It would seem that I have a huge sugar problem. My jeans are starting to realize this addiction and are starting to protest a little bit. This fudge was one of those ones that was too good for it’s own good. I have to sadly admit that I ate my fair share of this one. I decided it was better if I got rid of this as fast as I could. It went with us to Thanksgiving, but even there I couldn’t help myself from snagging a piece every time I walked by the dessert table. This fudge is so perfectly soft. It isn’t your traditional hard and heavy fudge. It is actually very soft and light. Sugar laden, yes, but what fudge isn’t? The pecans on top help add just a little bit of saltiness to tame the sugar down a bit. 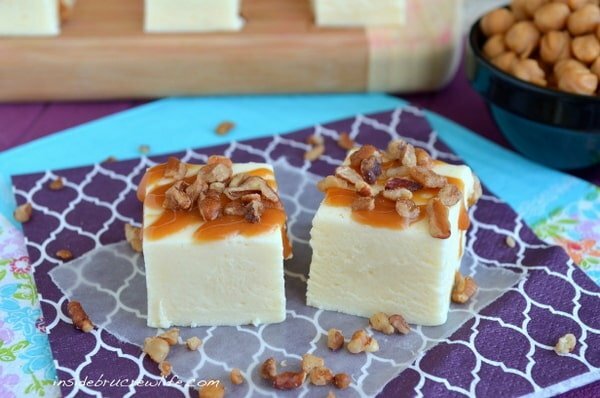 The idea for this fudge came from a little booth we visited at a craft fair earlier this fall. I have a confession…I don’t usually buy fudge at places like these. Most times I go in these shops for the free samples and for the fun new ideas. 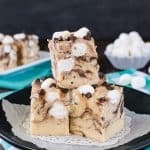 Last year I found this cappuccino fudge at a fair, and I had to come home and make it in my kitchen. I may or may not have snapped some pictures of the fudge booth while I was in there scoping out some new ideas. Just means I have a few more fudge ideas up my sleeves for you in the coming weeks and months 🙂 It is becoming one of my favorite things to make!!! I blame thank Aimee for making me love fudge with pudding in it! 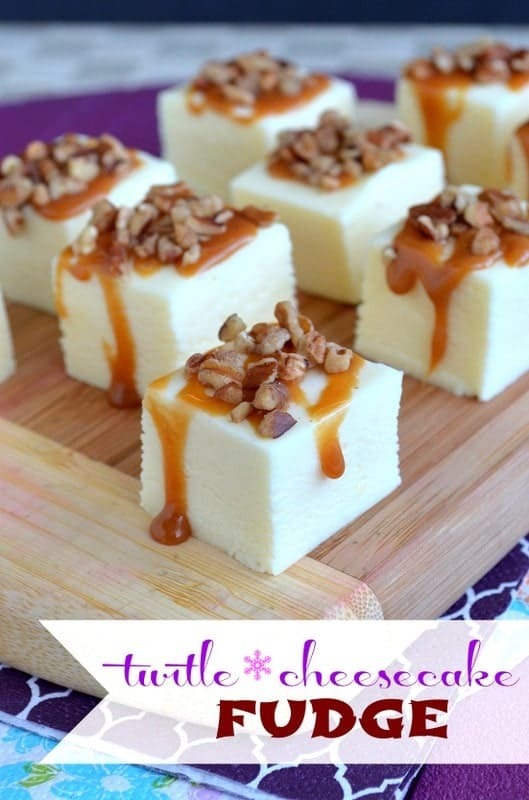 Easy fudge recipe made from white chocolate chips and instant cheesecake pudding mix. Combine the chocolate chips, butter, salt, and condensed milk in a saucepan. Heat over medium-low heat until melted and smooth. Stir in the pudding mix and stir until combined. Stir for another minute while the pudding mix dissolves into the mixture. Add in the marshmallow fluff and stir until melted and smooth. Pour fudge mixture into a wax paper lined 8x8 pan. Refrigerate until set. Remove from refrigerator and cut into 49 small squares. Combine the caramel and water in a small saucepan. Heat until melted. Cool slightly and drizzle over fudge squares. Sprinkle with pecan chips before the caramel hardens. I am not a huge fudge fan, but you tempt me by telling me it is softer. This maybe a fudge I could get on board with. It’s good to know I’m not alone in these sugar afflictions:-) Those cupcakes sound awesome!!! Thanks for the pin love! Thank you so much:-) I use a Nikon D5001 camera and on this picture I used the 18-55 mm lens. i’ve never put fluff or pudding mix into fudge before!! I have to try it. 🙂 Oh and fudge – I just prepare my tastebuds and stretchy pants for a sugar overload when I make it. OMG! You put pudding mix in your fudge? How awesome; I’ve never even heard of that before! 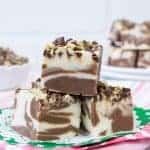 This fudge looks perfect for the holidays. Extra caramel on mine, pretty please! Haha! I completely blame Aimee for pudding mixes in fudge:-) Extra caramel is always welcome here!!! I’m not a fan of fudge or cream cheese but the boys & hubby LOVE fudge. I’m betting they would be nuts over the cappucino or mocha fudge! ha! see, I read that wrong. I saw cheesecake and immediately thought of cream cheese. I knew it was too early in the morning to be speaking! Oh girl, you did awesome here. What a winning combo!! Addicting, I’m sure! I suffer from the same sweets addictions…and need for stretchy pants! I love the idea of using pudding mix! I’m totally addicted to pudding mix in cookies, why not fudge? And, I know what you mean – about the jeans and about the fairs. I never buy stuff there, I always come home and make it! You and I have the same pudding addiction now:-) I can’t stop making cookies and fudge with it. It’s more fun to make these things at home with our own twists!!! I blame Aimee too! Now pass me some of this fudge! Thus is a party fudge, deserving of a prime spot on the dessert table! Yum! At least we have someone else to blame for all this fudge:-) I wonder if I can blame someone else for all the cookies and pastries too??? I am normally a all chocolate all the time, but I think I need to give these a try! I love the holiday’s! I know how you feel about sweets. I could eat them for every meal. The only problem would be I know they are not healthy and I would weigh 300 plus pounds if I did. I really have to watch how much I eat to hold my weight at a fairly decent point. Not easy!!! I love what I have seen so far. 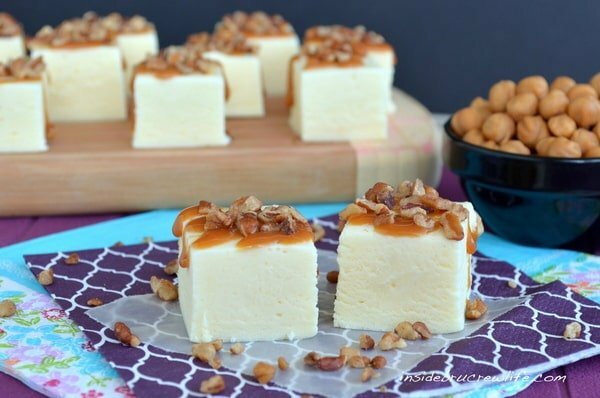 Cheesecake fudge! Oh my, I love anything cheesecake. This is going to the top of my list. I was just wanting to clarify “marshmallow fluff”…. Do you mean marshmallow cream in a jar? It’s what I would assume but the jars here in Texas don’t say marshmallow fluff. Yes, it is the same stuff. I think it depends what brand you have in your stores. I went ahead and changed the recipe to creme because I did use the Kraft jar. 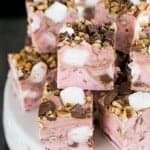 Ooooh, I LOVE fudge, and I’m totally intrigued at the idea of using pudding mix and fluff in it. These pieces look so light and fluffy and perfect. And I love the caramel drizzling down the sides. YUM! You are not alone my friend, I ate cheesecake for breakfast the other day!! I have to try fudge with pudding!!! I love the caramel dripping down the sides! You had me at cheesecake, but then fudge, too? This sounds amazing! And I have had a lot of opportunities to practice my self control lately. Sugar, love it/hate it. Whoa! These look AMAZING-So perfect for the season! Thanks:-) Fudge really is perfect at this time of year…although I wouldn’t mind eating it all year round! 3. YOU ARE KILLING ME! 4. Since I’ve discovered all these wonderful people via ONBC I am the QUEEN of stretchy pants! Um…insane! Insanely delicious and an immediate pin! These are beautiful and they look delicious. I have a link party called Wednesdays Adorned From Above Blog Hop and would love to have you share this with everyone. Here is the link to the party. I’m following you and would love to have you follow me. This looks awesome! I will have to try it, for now I will pin it. Oh my goodness! If these taste as good as they look my family are going to love them!! Oh sweet mercy!!! Please tell me these are gluten free!!! I’d have to make my own caramel probably since “caramel color” is suspect (and I, imagine, in the caramels. it’s been so long since i’ve bought pudding mix, I don’t remember what’s in it. But these look like they’d be worth the reaction lol! I’m thinking of making these for an upcoming cookie/goodie exchange. I would like to make them a few days in advance. Wondering about storage and time frame they might keep until serving. They look delish! You could definitely make these a few days earlier than your event. I would keep them in a sealed container so the fudge doesn’t dry out. Got SOOOOoooo excited when i saw this pinned! I’ve been dying w/o cheesecake for 3 years! (hubby and i even had a cheesecake for or wedding!) 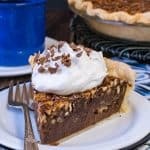 Read the recipe, and my heart sank! My 3yo is egg allergic, hence the cheesecake ban. This also means no marshmallow fluff!! Any ideas on an egg free recipe?!? 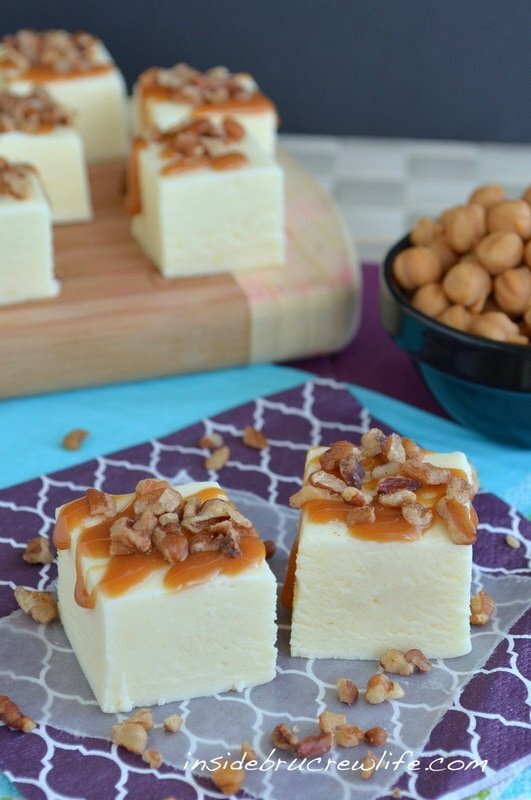 I confess i was never a fudge lover, and a lighter, and cheesecakier version appeals! I have have sweet problem too my friend – yum! Looks delicious! I Pinned this for future reference! Oh I’m glad we were able to figure it out. That’s an easy one to miss because most people think can when they see condensed milk. I am going to revise the recipe to say cup for future bakers:-) Hope you get a chance to try it again! 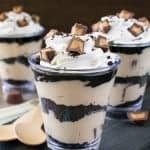 Cheesecake PUDDING mix? I think I’m totally lost here as I’ve never heard of it…. p.s. I’m Canadian… is it at U.S. product? It might be…I’m not sure everywhere that Jello sells their puddings!!! I’m sorry you can’t find it! Would it be the cheesecake jello mix? It’s like an instant cheesecake mix, jello brand…. Yes, that is the same one that I used in this fudge. Since there are no comments on how good they are from other people who actually made them (successfully)…I feel obligated to let anyone who is wondering whether they should make this or not…DO IT! i couldn’t resist giving it a try..made them tonight and OMG…delish!!! thanks so much for sharing the recipe! Now I really want to know what I did wrong…I followed the recipe to a T.
I am so sorry to hear it didn’t work for you. I wish I could be there with you to help you figure it out. I have made this fudge so many times and never had a problem with it setting up. You just used 1 cup of the sweetened condensed milk right? Not evaporated? And then 1 and 1/2 cups of marshmallow cream? If all that is right, it should set up just fine. Wonder if you could use cream cheese in these instead of the pudding mix might require a bit of cornflour/cornstarch. Thin is not all countries have instant pudding. i went to make this… but have not been able to find this cheescake pudding everyone has gotten? where did you find it? and if i cant find it , what would you subsitute for it.. its sounds devine! I found the cheesecake pudding at Walmart. You could use vanilla pudding as a substitute. 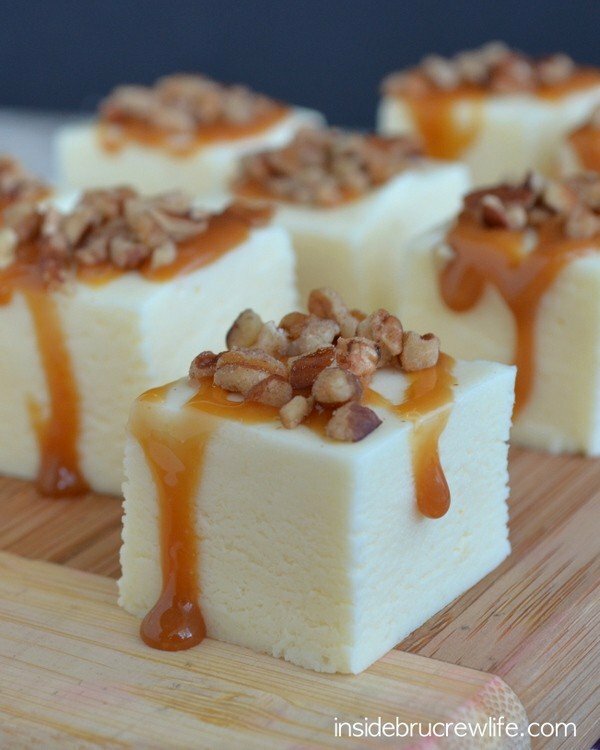 It just would be vanilla fudge with caramel topping. The 1 1/2 cups of marshmallow fluff, is that just 1 jar? It is just one 7 oz. jar, but I measured it out just in case someone bought the bigger jar. I’m sorry but I made these and I do not see what all the hype is. First we can’t even taste the cream cheese pudding and they really only taste like a melted white chocolate bar, I let my neighbor try it and she loves any kind of sweets but did not like these. Sorry but I would not make these again. I tried it because ik love fudge, white chocolate, and cheese cake but it was nothing i was hopikng for! This recipe sounds fantastic! Can you tell me what you mean by :”caramel baking bits” . I can’t wait to try this! Thanks so much for sharing. They are tiny balls of caramel made for baking with. I buy them at most stores in the baking aisle by the chocolate chips. 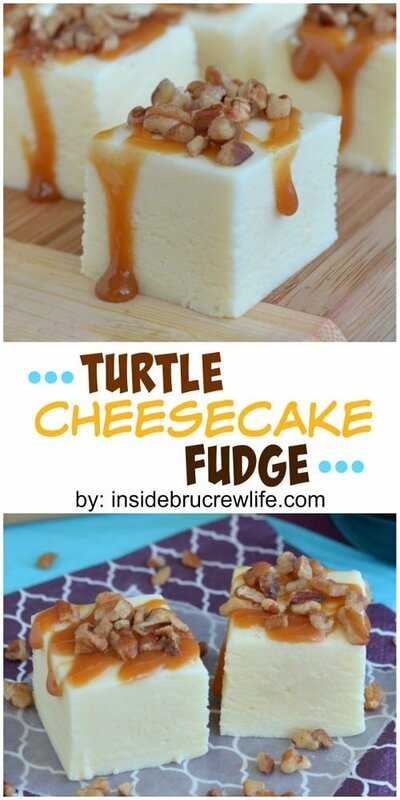 I pinned this fudge because I love anything turtle, but I am disappointed to see the pudding mix in the recipe. I knew that it wouldn’t be “healthy” but instant pudding mix is full of harmful chemicals and artificial flavors. I guess I will have to go without turtle fudge this year or attempt my own recipe without such harmful ingredients. Everyone has different opinions on ingredients. I respect that you don’t want to eat it, but I happen to love instant pudding mixes. You can make the fudge without the pudding mix too. It would just be a white chocolate turtle fudge. I wonder if it would work to swirl the caramel into the fudge as we’ll…??? I have only made it with the caramel on top, but I think it would probably work to swirl it in the middle. Ok I made this tonight, and it tasted amazing. However it was still a little gritty like the pudding didn’t mix all the way, any suggestions on how to get it to dissolve better. I do plan on making it again. I also haven’t put the caramel on top yet we were just as happy without the caramel as we wanted to try it. I will try it again, I do suggest trying to make this fudge. I premake the pudding then add it to the mixture. Taste amazing and no grittiness. You make the pudding mix with milk and then add it to the chocolate chips???? You should only add the dry pudding mix to the melted mixture and let it cook slightly. This helps get rid of the grittiness as well. The pudding mix does leave the fudge slightly gritty. It shouldn’t be that noticeable though…I thought that texture kind of disappeared the longer the fudge sat in the box. You used the same brand pudding that I did too! I added the pudding into the melted chocolate and condensed milk and stirred quickly for about a minutes. Then added the marshmallow cream and stirred again until that melted. I want to try making this but couldn’t find the 3.4 oz. jello cheesecake pudding size. I have a few boxes of the 1 oz. size. Should I use a few of them to equal the 3.4 oz. size or use just one box? I don’t want to mess this up. :0) Thanks! Are the 1 oz. size the sugar free? If so, just use one box, and it should be fine. Let me know how it goes! It is the sugar free. I’ll try it and report back. Thanks! Mmmm this sounds divine! 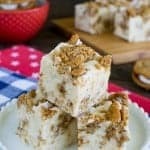 thx for linking to my cake batter fudge! I can’t wait to try this one! Should the mixture be a certain temperature? I tried last night to make this but it didn’t get hard. What do I need to do? It should set up enough that you can cut it into squares, but it will not get hard as it is a softer fudge.